followed by much information at bottom of page. We are located near Kansas City, KS (only 7 miles west of the Kansas Speedway) on a small 5-acre hobby farm. We are TICA (The International Cat Association) Registered and State Licensed Bengal Breeders. We are a small cattery raising only TICA Registered Bengals with Champion bloodlines, and just a few litters per year. 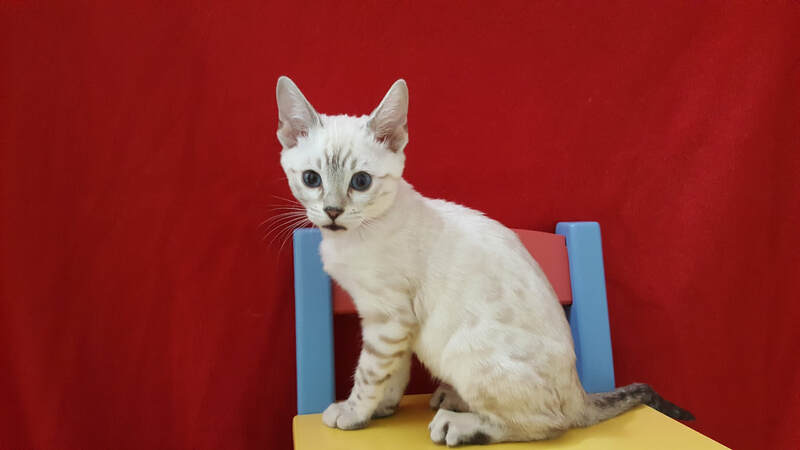 We strive for healthy, happy, adorable Bengal kittens who meet the breed standard and are VERY well socialized. 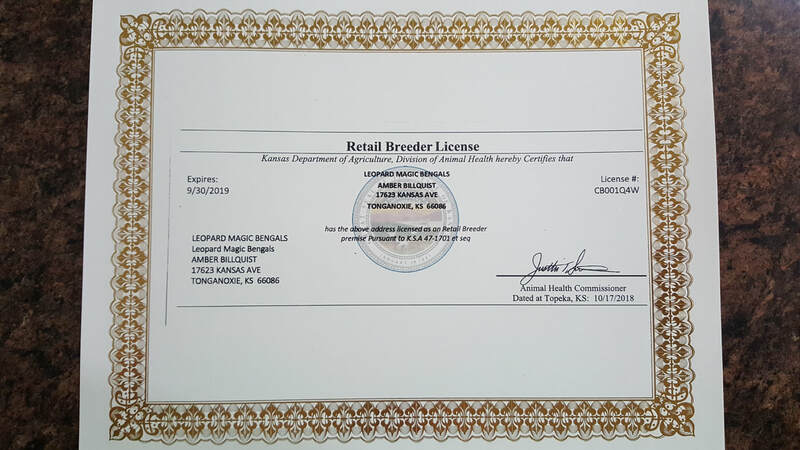 UPDATE: In July 2017, I had my inspection of my facility, which I passed, and I become licensed as a Retail Breeder through the State of Kansas. I have also been inspected again since then, with no deficiencies. to now charge sales tax of 7.5%. one more reason to feel secure about working with me! To verify my license, click on link above, then click on "Retail Breeders". email, text or Kitten Application, please, not a phone call. I do not answer calls from numbers I don't know. Please use a full-size screen for best viewing of this page. REDUCED DUE TO AGE... Was $1,700 NOW $1,000 as Pet! 10% of the price of the kitten, with the minimum deposit being $100. For kittens sold WITH Breeding Rights, the deposit will remain at $500. Preferred payment methods are Cash & PayPal. Cashier's checks are also fine. Debit and Credit cards can be accepted with a 3% fee. Personal checks can only be accepted for deposits on kittens less than 10 weeks old. REDUCED DUE TO AGE...Was $1,600, NOW $1,000 as a Pet! REDUCED DUE TO AGE...NOW $1,000! REDUCED DUE TO AGE... NOW $1,400! REDUCED DUE TO AGE... NOW $1,600! REDUCED DUE TO AGE... NOW $1,500! Merica & Tanner... Babies born Oct 16, more details soon! Quinterra & Tanner... Babies born Dec 27, more details soon! Ivory & Legacy... Babies born Dec 29, more details soon! 2ND KITTEN DISCOUNT: I give 10% off the price of a 2nd kitten purchased from me at ANY time. The discount is figured on the price of the more expensive of the two kittens. WHY 12 WEEKS OLD OR OLDER? please leave us a REVIEW on our Facebook page.....Thanks! Below are 2 maps showing our location 7 miles west of Kansas City, KS. Below are my Visitor Counters which I added in October 2013.
but is registered with TICA.